The new C-One startup "Newboot"
Newboot brings a completely new life to your C-One - no matter if you have the FGPA extender card or not. Why should you upgrade? With all these new features, there's also one drawback: Newboot cannot load cores from CD-Rom drives any more. With flash cards being larger than the average DVD already, we believe that this won't really affect you in everyday-life. Unpack the complete directory structure to your CF card. If the card was not empty, you will notice that the archive blends in with your existing BigBoot installation, as it will show a new entry number 0 called "Preview new startup". Now that you are in the new startup screen, your first goal is to get back to the BigBoot screen. 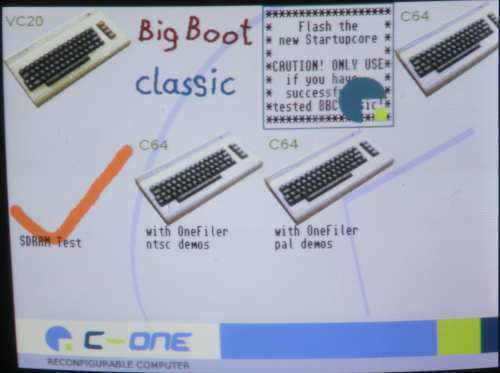 You do that by moving the cursor (the C-One logo and frame around the icons) over the BigBoot-icon (the funny hand-drawn one). Either press the joystick button or the return key to make your selection. Are you back now? Great, if you see the familiar blue/yellow BigBoot screen, just re-confirm the version number in the top left corner of the screen: It should now show V1.01, as a sign that BigBoot has been launched from Newboot. This is it, you're ready to update your C-One! In case something did not work as expected, you should NOT flash your C-One. Instead, you should exchange the 72-pin SIMM module for a new one. The speed should be 60ns or faster (some 70ns types also work), it can be EDO or FPM memory, and it must be 1MByte or larger. We have successfully tested lots of modules, and don't have a single one that doesn't work with this release version. Your module will most probably work - if it doesn't, please contact us, so we can find out what's the cause. After flashing, you are prompted to power-cycle your C-One. The one thing you need to understand about Newboot is it's directory structure. We have prepared a separate page for this, as it's a lot to read. Click here for the explanation of the directory structure. In short: Every menu item has it's own graphics and cores. Changing between menu levels really means that FPGAs are re-configured. This is happening so fast that you will hardly notice it - the monitor loses sync for a split second, and then you're in the next menu item. For the first time, the true power of the C-One is being utilized: Both FPGAs can re-configure each other while running. 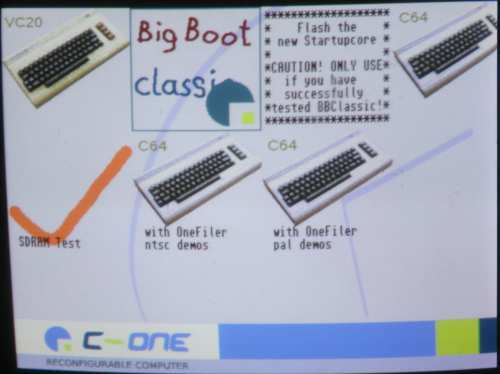 With the old BigBoot, the 1k30 was fixed, and the 1k100 was re-configured according to the menu item that you have chosen. With NewBoot, both FPGAs are re-configured a number of times while you are browsing through the menu. There is hardly any explanation necessary for using the menu - move the cursor with the joystick or the cursor keys and select with the joystick button or the enter key. This will either start a core, or get one level deeper into the menu structure. If you want to go up in the menu structure, press the ESC key. This is it, have lots of fun with the new look of your C-One! If you have any question, we're glad to answer, either on the cone_cores Yahoo group, or by eMailing individual Computers.